iToon portable is a funny application which converts your digital photos into cartoons like GTA style without PhotoShop. The best and unique thing is that it has very easy to use interface and you don’t need to learn any skill for using this application. It has very powerful converting engine which has ability to apply automatically realistic cartoon effect into images. Not need to be a photoshop expert, with iToon apply cartoon filter automatically to your photo! Cartoon yourself with iToon like a real artist! Not need to be a photoshop expert, with iToon apply cartoon filter automatically to your photo! Require Windows PC. No need internet connection! 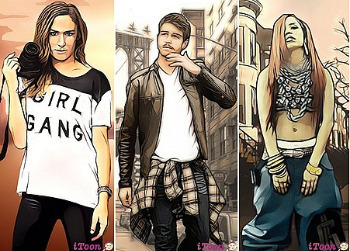 Turning your photo to GTA Cartoon character in one click, select your photo and choose the effect that you want, there are more than 8 GTA and Cartoon styles filters.